Smith and Nephew Acticoat 7 Day Silver Wound Dressing from HealthyKin.com utilizes advanced silver technology to help create an optimal wound environment. 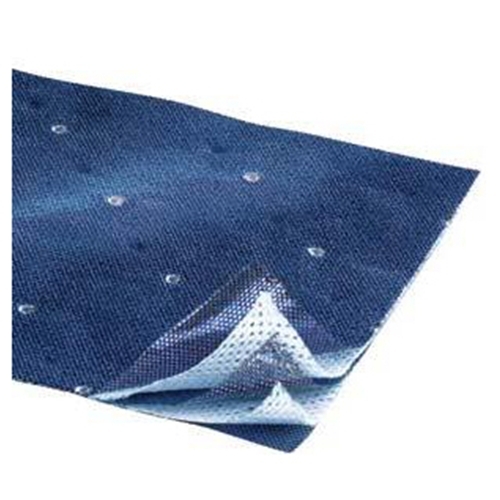 Rayon/polyester core helps manage moisture level and control silver release. Silver-coated high-density polyethylene mesh facilitates the passage of silver through the dressing. The nanocrystalline coating of pure silver delivers antimicrobial barrier activity within 30 minutes - faster than other forms of silver. NUCRYST Pharmaceutical's antimicrobial technology is able to produce silver-coated polyethylene films that can release an effective concentration of silver over several days. Thus, as silver ions are consumed, additional silver is released from the dressing to provide an effective antimicrobial barrier. This patented silver-based antimicrobial technology can be applied to a wide range of medical devices including wound dressings, certain types of catheters and various implants to prevent infection. This technology was first applied to burn wound dressings because burns present a very severe risk of infection. Acticoat 7 is a excellent product I have been using it along with other meds to treat my open wounds. I have been using this dressing along with UMF 15+ Manuka Honey to treat a MRSA staph infection on our German Shepherd Dog. He had a deep wound in his center paw pad that the vet could not heal. He said it was either amputate or put him to sleep. Silver and Manuka Honey were the two things I researched on the internet that can actually kill MRSA staph infections. MRSA is notoriously famous for being resistant to most tradtional antibiotics. The directions for the silver dressing is to moisten the whole surface of it with water. Instead I use the honey. This 7 day dressing is a blessing because my dog hates to have his bandage redressed. So I only have to do it once a week. I also had to become very adept on properly bandaging him so he couldn't pull it off and also to make sure it stayed moist. The moisture activates the silver and keeps the impregnated silver flowing to the surface to help the healing process. To heal MRSA is slow going, especially in a deep wound on the bottom of a dog's foot- as they don't realize they are seriously injured so it must be well-padded and bandaged. I am happy to say that although it took 6 months of Smith and Nephew Acticoat 7 Day Silver Wound Dressings combined with the Manuka Honey, our AKC American Champion German Shepherd Dog- "Sam"- is now 100% healed! His paw pad went from constantly raw for 6 months prior to this treatment last July after he attacked a bear that wandered into our yard. Now his paw pad is back to being black and is thickening up better each week. I will continue the treatment for another month just to be on the safe side, but all and all I can't say enough about the miracle of this silver wound dressing! It definitely saved our big guy's leg from being amputated...or worse, being put to sleep. THANK YOU FOR THIS PRODUCT! Susan Gionfriddo and "Sam". Granville, Massachusetts USA.